CO Bob Prashaw from the MNR’s Guelph District passed away on August 19, 2004. He had just returned to the Vineland office from a day’s patrol when he suffered from a massive heart attack. Despite attempts to save him, he died a short time later. He is sadly missed by his family, friends and fellow officers. “On August 19th, 2004, Bob and I were out checking people fishing at Navy Hall in Niagara-on-the-Lake. Navy Hall is a well known fishing spot on the Niagara River. Bob went down to talk to a couple of individuals who were fishing at the base of the steep embankment. When he came back up, he complained of chest pains, a tightening in his chest. We talked about it, he thought it was nothing, yet he agreed to go to the doctor’s the next day to have it checked out. Because he wasn’t feeling well we returned to the office. I went to my office and he went in to the main office to chat with staff member and close friend Greg Belmore before he left to go home. It was there he collapsed. Emergency 911 was called. Conservation Officer Nelson Denyes was right there and did what he could to assist Bob. CO Nelson Denyes is a volunteer firefighter, I am sure he knew what he was doing, until the paramedics arrived. The paramedics tried several times to restart the heart. He was promptly transported to the Hotel Dieu Hospital in nearby St. Catharines Ontario, where he was pronounced dead. 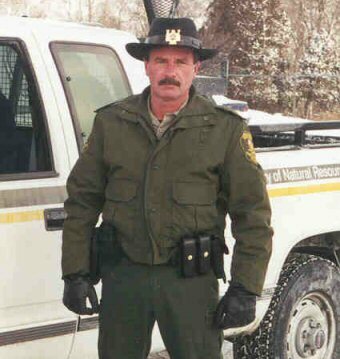 At Bob’s funeral on Monday August 23, 2004, his family and friends were joined by a large number of Conservation Officers in full uniform, and an MNR Houour Guard, to pay him the respect he deserved. “I have the distinct privilege of saying a few words about Bob Prashaw. I worked with Bobby here in the old Niagara District during the mid 80’s. Not only did we work together, we were also hunting and fishing buddies, and we were partners in a fuelwood cutting back breaking money losing venture, on some of the crown woodlots west of Dunnville. Co-worker and friend. Many of us have fond memories of Bob. Bob started his career with Rockpoint Prov. Park and he was Rockpoint Prov. Park. It was his park. As Superintendent, at the end of a busy week Bob would kick back and unwind along side his staff with a case of beer. His passion for hunting, fishing and his concern for conservation made him a natural Conservation Officer. Bob was badge #499 and he wore his uniform proudly. To enforce the Fish and Game laws and live in a small community, where everyone knows everyone else, is not easy. Bob was able to pull this off in style and gain the public’s respect in the process. Bob cared deeply about the natural resources and he demonstrated this on a daily basis. For example every spring Bob would drop by the Dunnville Fishway and perk up the spirits of Conservation Club volunteers who were helping to monitor the fish run in the Grand River. The recommendations that Bob brought to the Grand River Fisheries Management Planning table and the regulations changes to the Lower Grand were warmly received and I might add, implemented. He was part of why this is one of the best managed fisheries today. I would like to share a story about Bob in the field. One day, Bob was out in the field and was checking anglers. He came upon a disgruntled angler complaining he had been checked numerous times and felt he was being unfairly harassed. The angler stated he as a taxpayer, he paid Bob’s salary. Bob reached into his pocket for a quarter and gave it to him then asked him for his change back . That was Bob. As a result of a nuisance squirrel complaint that ended up at the Omsbudman office, Bob became the unofficial nuisance squirrel officer. It didn’t matter in which area the complaint came from “it was given to Bob.” The office staff would sit back and watch the sparks fly. Bob was also one of Vineland’s picket Captain during the last strike. He supplied the burn barrel, wood and even became chief cook and built the shelter. The shelter was never used but that was no reflection on his craftsmanship. If Bob couldn’t make something he would know where to find one. He was very resourceful. We all remember Bob’s best known phrases, “I’m going out for a smoke break”. If you hesitated 30 seconds you’d miss him and the break. Or when he was talking to female staff members he always started with “darlin’. Many of us would share our weekend tales and Bob’s was always the same “He’d cut the grass”. He was very domesticated, he loved cannin’ vegetables from his garden and he always willing to share his harvest. Including his pickles, which he was famous for. As the senior officer at Vineland, Bob was respected, loved by his peers and fellow workers Some were with Bob when he left us. We are all the better having known Bob and we will miss him dearly. What would Bob say to us as his parting words… look after things here in the Dunnville area and his beloved Fish and Wildlife resources. Do everything you can to protect them. I’m sure Bob would also tell us, to live each day to the fullest, like there was no tomorrow and make today count and take the time to care for each other. I would like to close by reading an untitled poem by an unknown author. “Have you ever watched kids on a merry-go-round Or listened to rain slapping on the ground? Ever follow a butterfly’s erratic flight Or gazed at the sun into the fading night? You better slow down… Don’t dance so fast – Time is short… The music won’t last. Do you run through each day on the fly? And when asked, “How are you”? Do you hear the reply? When the day is done, do you lie in your bed With the next hundred chores running through your head? Ever say to your child, “We’ll do it tomorrow” and in your great haste, not see his sorrow? Ever lost touch, let a good friendship die Cause you never had time, to call and say “Hi”?